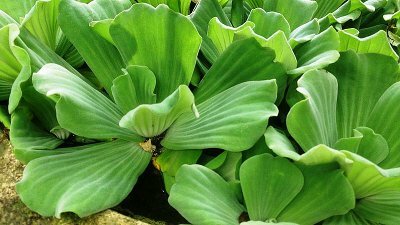 The Water Lettuce, Pistia stratiotes, is a naturalized ornamental water garden plant that has fairly tiny flowers. The tiny flowers have a whitish color to a pale green spathe. In addition, they have small green berry like fruits. They can grow to a height of fifteen centimeters tall to thirty centimeters wide under great growth conditions. These beautiful Water Lettuces have small lettuce like rosettes of whorled leaves which floats on the surface of water bodies. The plant has its leaves wedged shaped and lined with parallel veins. It is spongy, water proof, velvety-hairy and pale green in color. These lotus plants usually have long roots which measure approximately twenty inches long. Their roots may daggled in water as they propagate through the use of sotlon. The Water lettuce plants are good for any pond size as they can grow well in both slowly moving fresh water bodies such as reservoirs, ponds, lakes, creeks and rivers. With their growth, these plants usually tolerate temperature between fifteen to thirty five degrees. It is important to note that the optimum temperature which this type of plant needs for growth is approximately between twenty two to thirty degrees. They are usually frost sensible and this explains why they have their growth reduced by the long cool winters located along the temperate zones. Normally, under favorable conditions, the water lotus grows and expands so fast. The water lettuce will produce an abundant growth that quickly forms a destructive mat. The dense floating mats may have limitations which may negatively impacts on the native aquatic plants. In addition, they may also interfere with irrigation activities. Water lettuce is a floating pond plant that may have originated from Africa, Asia, and equatorial America. The water lettuce may have been introduced to dams and rivers through the via eel traps from Queensland. In these parts of the world, the water lettuce is considered an aquarium plant as well as a water garden specimen which is sold in nurseries. Lakes, rivers, reservoirs and slow moving streams are most likely to be the breeding places for the plant especially around places like the subtropical parts countries.